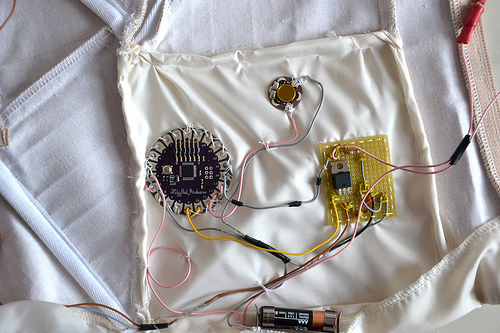 RUAH is an interactive corset powered by Arduino Lilypad and created by Giulia Tomasello for her BA graduation project. 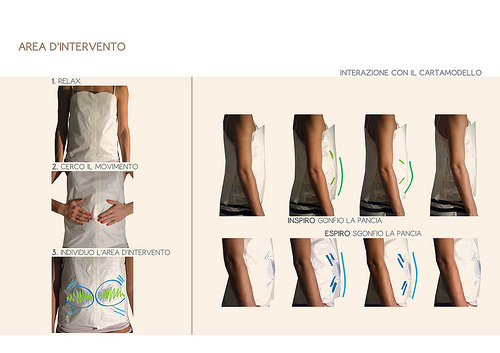 Its main aim is to help people into learning the importance and the benefits of a deep diaphragmatic breathing. 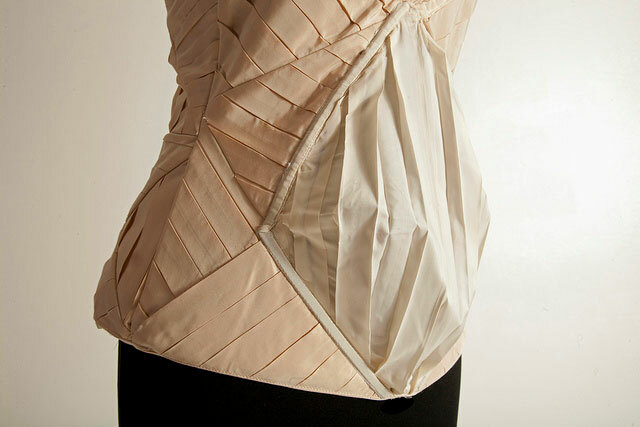 The circuit is composed by a sensor sewn on an elastic belt and an actuator placed inside the corset. The stretch sensor catches the move of diaphragmatic breath and sends a feedback from Lilypad to muscle wire, a flexinol spring, inflating and deforming the centre of the structure. breathe, increasing his sensory abilities and his physical endurance. The slow controlled breathing, which balances body and mind, is acquired only after a long workout. As the wearer feels it like a real second skin, RUAH transmits and receives emotional feedback, contrasting a continuous sense of stillness and movement, opposite feelings that surround us and join up to ecstasy. If you are interested in checking out the details of the project, you can explore Giulia’s pictures of the work in progress and her github code repository, after watching the video below with the Ruah in action! It is appropriate time to make a few plans for the long run and it’s time to be happy. I’ve learn this publish and if I may just I desire to counsel you few interesting things or suggestions. Maybe you can write next articles relating to this article. I desire to read even more issues approximately it! Fantastic publish, very informative. I ponder why the opposite specialists of this sector do not understand this. You must continue your writing. I am sure, you’ve a great readers’ base already!|What’s Going down i’m new to this, I stumbled upon this I have discovered It positively helpful and it has helped me out loads. I am hoping to give a contribution & aid other customers like its aided me. Great job. your risk even more for other dieseases.